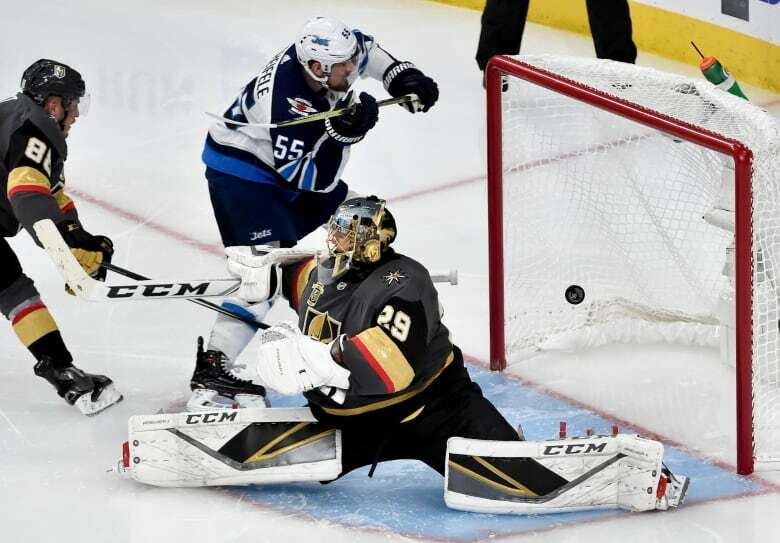 James Neal's goal and assist paced the Vegas Golden Knights to a 4-2 playoff win over the Winnipeg Jets on Wednesday. The expansion Golden Knights lead the best-of-seven NHL Western Conference final two games to one with Game 4 back at T-Mobile Arena on Friday. The series returns to Winnipeg for Sunday's Game 5. The winner of the series advances to the Stanley Cup to face the winner of the Eastern Conference final between the Washington Capitals and Tampa Bay Lightning. The Caps led that series 2-1. Neal briefly left the game and headed to the dressing room after a hard hit from Jets bruiser Dustin Byfuglien in the opening period, but the Whitby, Ont., winger scored and set up the eventual winning goal in the second. Jonathan Marchessault scored twice, including an empty-netter, for Las Vegas with Alex Tuch also contributing a goal to the victory. Mark Scheifele scored his NHL-leading 13th and 14th playoff goals for Winnipeg, but the Jets suffered a second loss in a row for the first time in this post-season after falling 3-1 at home Monday in Game 2. Scheifele's 11th playoff goal on road bettered the NHL record of 10 previously held by Pittsburgh's Sidney Crosby. Golden Knights goalie Marc-Andre Fleury had 33 saves for the win and fended off the Jets in the third when they outshot the hosts 16-8. He got his toe on a Byfuglien chance with less than four minutes remaining in regulation. Fleury stopped Byfuglien's point-blank one-timer in the second period and poked the puck away from an all-alone Bryan Little later in the period. "You get Flower as your goaltender, you're going to have chances to win games," said Neal after the game. Jets starter Connor Hellebuyck turned away 27-of 30 shots in the loss, but his mistake in the second period cost Winnipeg momentum after Scheifele's goal. Scheifele pulled the visitors within a goal 18 seconds into the third period on an assist from Kyle Connor. Tuch scored his first of the series at 8:13 of the second period for a 3-1 Las Vegas lead. Neal collected his own rebound and circled behind the net to feed Tuch in the slot. Scheifele's first goal briefly deadlocked the game in the second period, but Neal restored the host team's lead 12 seconds later. "For us to respond that quickly was really big for us," said Vegas head coach Gerard Gallant. Hellebuyck turned the puck over behind his own net for Haula to find Neal out front for a goal at 5:40. Scheifele re-directed a Blake Wheeler pass from the boards by Fleury's glove at 5:28. The Knights led 1-0 and Winnipeg had just three shots on net after the opening period, to the delirium of the white-towel-waving full house at T-Mobile Arena. 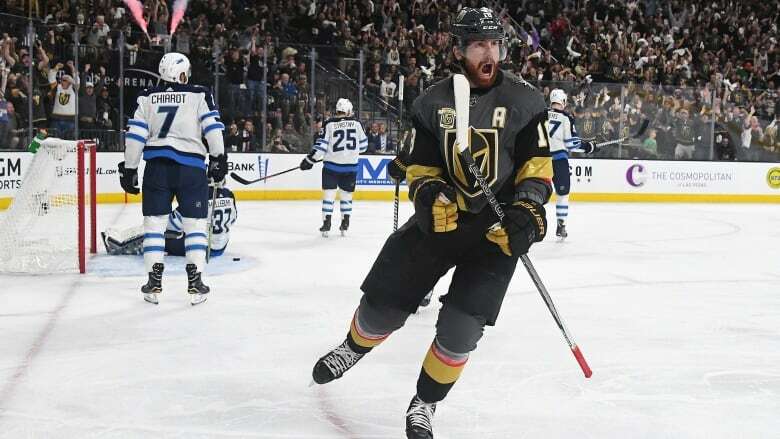 After a pre-game show featuring a Knight slicing a holographic jet in half with his sword, Marchessault produced the first two shots of the game and scored on the second just 35 seconds after puck drop. The 27-year-old from Cap-Rouge, Que., beat Jets defenceman Jacob Trouba in a footrace into the offensive zone to score on Hellebuyuck with a backhand shot.